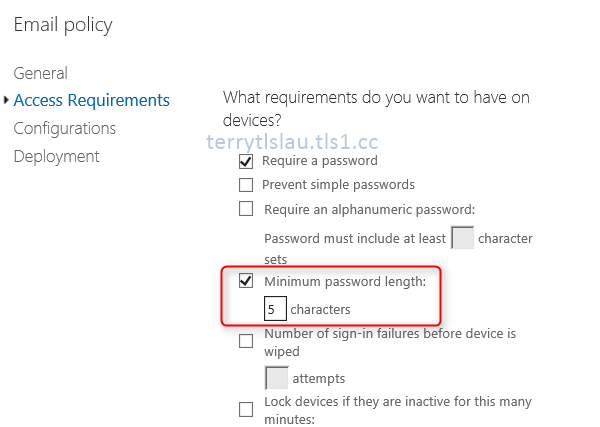 In this part, I'm going to talk about the security policy of Mobile Device Management on Office 365. 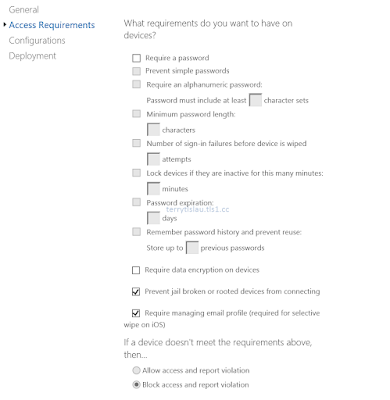 There isn't too much security policy and device restriction options on MDM of Office 365. And, Microsoft listed which security policy and device restriction can be applied to iOS, Android and Windows Phone. 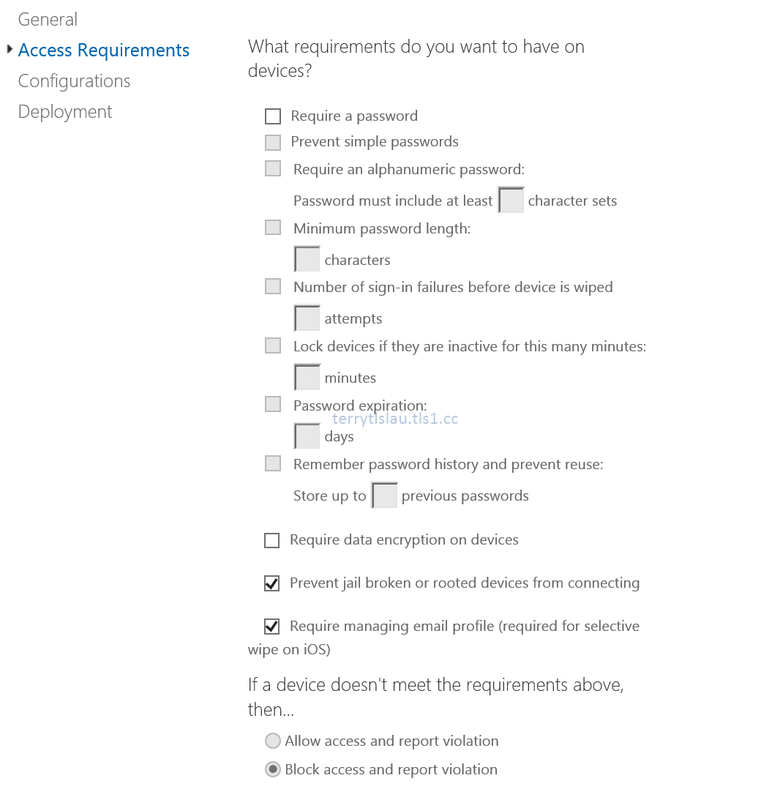 As you can see, many security policy and device restrictions can be applied to iOS devices only. These tables can help us to understand what security settings and restrictions are applied. Remark: There are some additional settings which are configured by PowerShell on Office 365. Can we apply 2 or more security policies or device restrictions to mobile devices? Yes, one device can be applied 2 or more policies. Which settings will be applied to mobile devices? If there is no conflict, all settings are applied to mobile devices. If the same setting with different values, the most restricted setting will be applied to mobile devices. 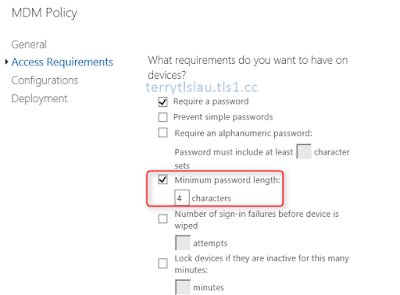 The first policy is configured "Minimum password length is 4". 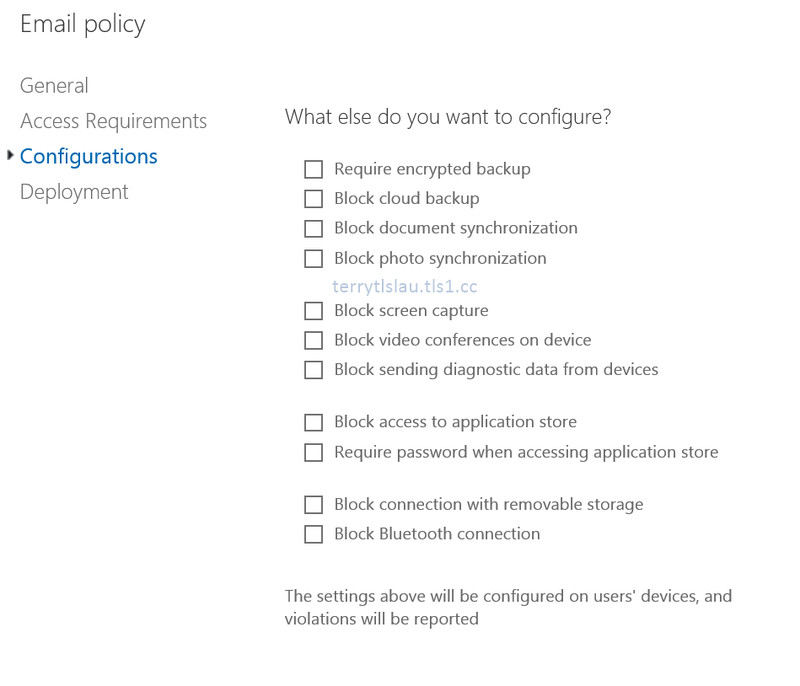 Another policy is configured the same settings to 5. Both policies are applied to the same user group. 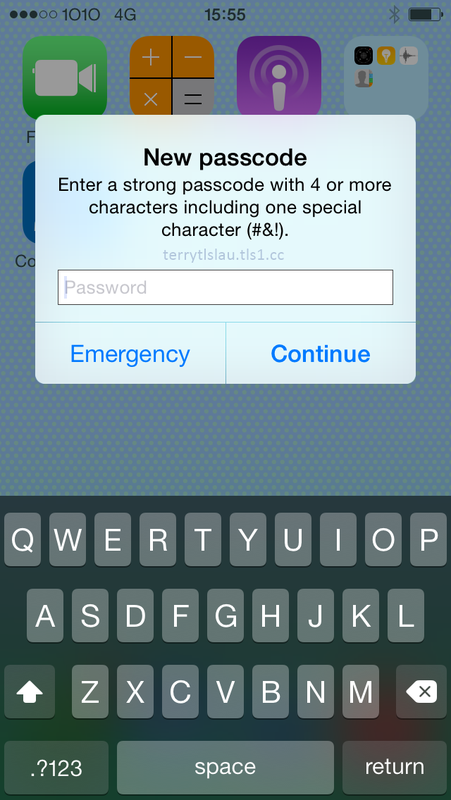 Then, users have to enter 5 digit passcode. 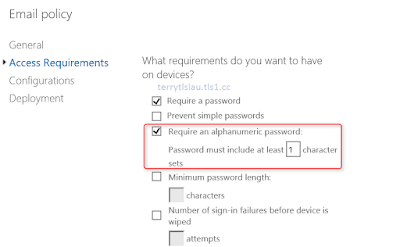 Another policy is configured "Require an alphanumeric password". 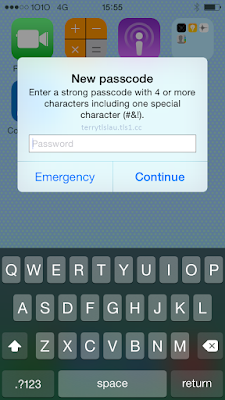 Eventually, users is required to enter a new password with 1 special character. 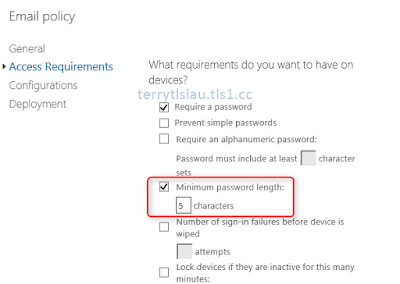 If the applied policy is removed on Office 365, what happen will be on mobile devices? If the setting is related to email profile on mobile devices, the email profile is deleted automatically on mobile devices. 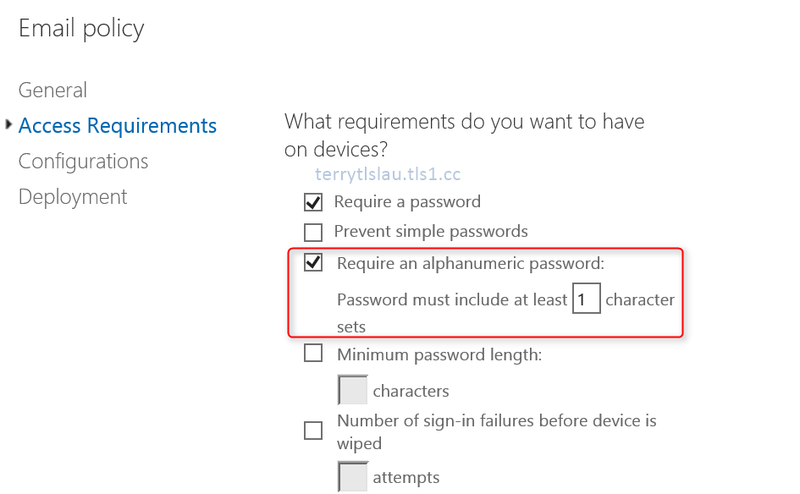 If the setting is password related, it doesn't pop-up to request users to change password. Users need to change a new passcode manually. Remark: When the policy is updating, it displays "Turning on" on the console but it hasn't applied to mobile devices. 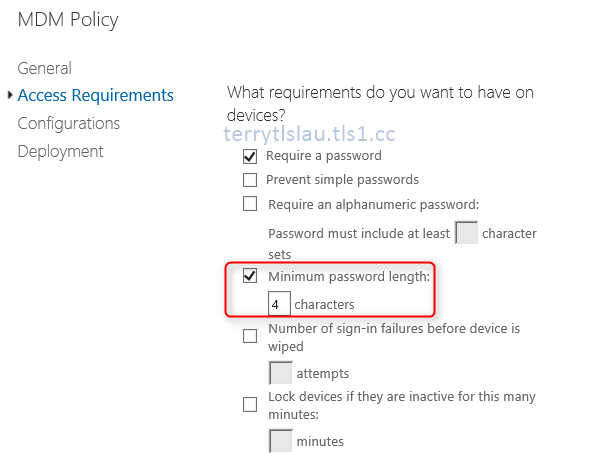 I hope it's easy for you to understand the policy on MDM of Office 365.